Elizabeth Smith Elementary held its annual Spelling Bee on December 18, 2018. The spelling bee is a part of the Scripp’s National Spelling Bee program in it's 90th year of competition. Twenty-three 3rd graders and 14 4th graders participated with the top 2 spellers from each class representing. The winner was Sheridan Riles from Mrs. Hirtzel’s 4th grade class. The runner-up was Isla Smith also from Mrs. Hirtzel’s 4th grade class. 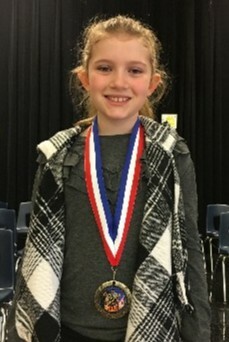 Sheridan will move on to compete in the district bee at the Performing Arts Center in February 2019 against the top spellers from each elementary, intermediate, and middle schools in the district.